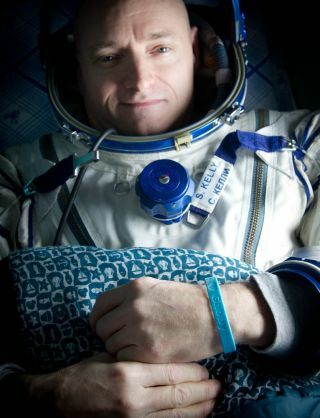 Expedition 26 Commander Scott Kelly wears a blue wrist band that has a peace symbol, a heart and the word "Gabby" to show his love of his sister-in-law U.S. Rep. Gabrielle Giffords as he rests shortly after he and cosmonauts Oleg Skripochka and Alexander Kaleri landed in their Soyuz TMA-01M capsule in Kazakhstan on March 16, 2011. When NASA astronaut Scott Kelly emerged from a space capsule Wednesday after 159 days in space, he carried the love for his sister-in-law Gabrielle Giffords, the injured Arizona congresswoman, with him in the form of a simple turquoise wristband. NASA photographs released after Kelly and two Russian cosmonauts landed on the snow-covered steppes of Kazakhstan in Central Asia show the American astronaut wearing a wristband with a peace symbol, heart and the word "Gabby" – Giffords' nickname – emblazoned on it. The wristband was delivered to Kelly on the space station by astronauts on NASA's shuttle Discovery, which visited the orbiting lab earlier this month, NASA spokeswoman Kylie Clem told SPACE.com. Expedition 26 commander Scott Kelly, wearing a turquoise wristband in honor of sister-in-law Gabrielle Giffords, looks out the window of a Russian Search and Rescue helicopter before the two hour helicopter ride to Kustanay, Kazakhstan shortly after he and fellow crew members Oleg Skripochka and Alexander Kaleri landed in their Soyuz TMA-01M capsule near the town of Arkalyk, Kazakhstan on Wednesday, March 16, 2011. Giffords is recovering from a gunshot wound to the head from a Jan. 8 shooting spree in Tucson that killed six people and injured 13 others. She is undergoing rehabilitation at a hospital in Houston, where husband Mark Kelly is training for launch. When Giffords was shot, Scott was commanding the space station in orbit – able to reassure his brother only via an Internet phone connection, and then only when space station communications systems allowed. Scott Kelly has told his brother that he hopes to help with Giffords as much as possible after his return home to Houston and chip in while Mark continues training for his two-week spaceflight to the International Space Station. The idea for the Giffords wristbands, however, came from Ryan Pont and Danielle Dobrusin who were interns in the congresswoman's office in Arizona. They were looking for a way to honor the victims of the Tucson shootings and were inspired by a sign outside Giffords' office that read "Peace, Love, Gabby," they state on their website: peacelovegabby.com. The color turquoise was chosen because it is Giffords' favorite, Pont and Dobrusin explain on the website. Proceeds from the sales of the wristbands and bumper stickers with the same message go to a scholarship fund created in the honor of Gabe Zimmerman, an aide in Giffords' office who was among those killed in the shooting. Demand for the wristbands has been so high, the fundraising group has them on backorder, according to its website.